I got the craving again. I hadn’t left the house all day which means I hadn’t had a full flavored Pepsi or Coke. I’ve got a pretty bad addiction to pop, so we only keep Diet or Zero pop in the house. When I lived on my own, it was nothing for me to drink the equivalent of 8-10 cans of Pepsi a day. Yup, you guessed. I put on a lot of extra weight for no good reason. J finally got me drinking Coke Zero which is funny because I prefer Pepsi over Coke….but I prefer Coke Zero to Diet Pepsi which is odd. Anyway, no Pepsi in the house. Only when we go out to eat or if I go grocery shopping and pick up a bottle. Since I had been in the house all day, I really just wanted to get out, so I decide to make a run to 7-Eleven. J was getting ready to go to bed, so she didn’t go with me. 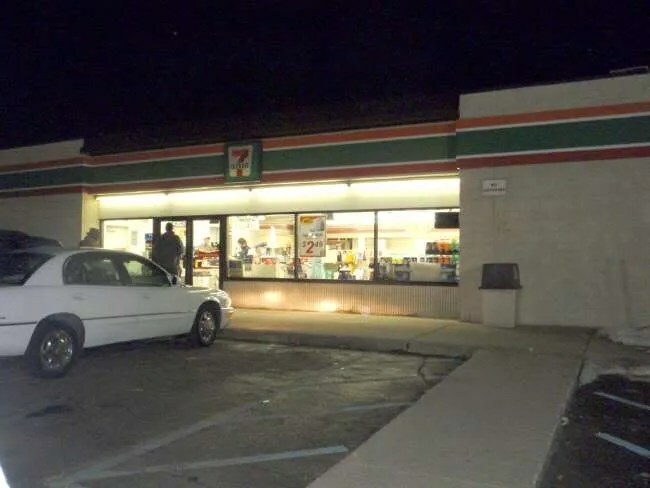 There are three 7-Eleven’s in the Kalamazoo area. I chose to go to the location on KL Avenue just west of Drake Road which is technically Oshtemo Township. I was coming from Main Street, so as I was coming up to the intersection, I noticed the sign and a turn in off of Drake Road. The 7-Eleven actually shares the small strip mall with Cottage Inn Pizza and Big Burrito. 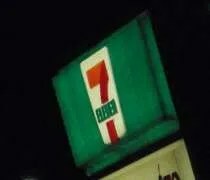 The light was either burned out or not turned on because it looked dark, but the lights inside were on and I knew 7-Eleven is always open. I was just in the market for a Slurpee so I made my way to the Slurpee machine and filled up a 32 oz. cup with straight Coke Slurpee. I don’t do the mixing thing that most people do. I’m boring and I just like my Coke. After finding the only straws they had were too short for the 32 oz. cup, I made my way to the counter to pay. What I saw standing there shocked me a little. On the way in to the parking lot, I almost hit a guy walking a dog. He was wearing dark clothes and I didn’t see him. He wasn’t in too big of a hurry to get out of my way either. As I go to pay, this same guy is also walking towards the counter after picking up some snacks and a bottle of pop. No big deal….execpt he’s still got the dog….in the store….and it’s not a service dog. The clerk never said a word about it. In fact, it looked like they knew each other and this happens all the time. Isn’t that a health code violation? Anyway, after the guy with the dog moved, I handed over my money so I could pay and get a move on. The slurpee was a $1.90, but it’s a treat that’s worth it every now and then. Slurpees are so much better than their gas station competitors. I’ve been to the store too. You should also try the Slurpees in the cups made specifically for Slurpee: they’re in the counter between the Slurpee machines, and the straws are in a dispenser behind the Slurpee cup lids. Look towards the machine from the door, and you will see them. Also, if you bring your own cup (like a freezer cup already frozen, hint!) they do refill prices!!!! Try the Wicked Apple, it tastes like caramel apple. P.S. : I know the guy you’re talking about in the article: Mountain Dew and chips at night! That WAS Lucky, a service dog for the emotionally impaired young man. I am glad you didn’t ask, because it would have been embarrassing for both of you; when writing a review, however, it might be a good idea to get the full story.